The initiative of this study derived from my concern of two critical urban issues in China today: housing and urban renewal. In the recent two decades, the Chinese urban housing stock underwent a significant, if not extreme, transformation. From 1949 to 1998, the urban housing stock in China largely depended on the public sector, and a large amount of public housing areas were developed under the socialistic public housing system in Beijing and other Chinese cities. Yet in 1998, a radical housing reform stopped this housing system. Thus, most of the public housing stock was privatized and the urban housing provision was conferred to the market. The radical housing privatization and marketization did not really resolve but intensified the housing problem. Along with the high-speed urbanization, the alienated, capitalized and speculative housing stock caused a series of social and spatial problems. The Chinese government therefore attempted to reestablish the social housing system in 2007. However, the unbalanced structure of the Chinese urban housing stock has not been considerably optimized and the housing problem is still one of the most critical challenges in China. As a social-oriented, step-by-step approach to avoid wholesale reconstruction, urban rehabilitation might be an alternative approach for Beijing’s urban renewal. It is the hypothesis of my study. However, here comes the question if this approach, originally developed in the West, can adapt to the Chinese situation. In a transitional society undergoing continuous social diversification and differentiation as well as ethical collision, contemporary Chineseness could refer to the hybridity of ethoses. Facing this super hybrid situation, the adaptability of the Western approach, which was developed in the context of the hybrid ethos (an ethos based on the common belief of individualism and consumerism), is questionable. Therefore, we need a pragmatic and inclusive theoretical thinking, as ontology and methodology, to guide and to frame the research. In my study, that is what I called the thinking of spatial phenomenon. Thinking of spatial phenomenon starts with an idea of pragmatization and phenomenalization of spatiality, which stems from both the Chinese tradition and the Western modernity. As an analytic tool, it includes different ethical viewpoints and is hence composed of three dimensions: the socio-economic dimension (a structuralistic point of view for the modern society), the community-placial dimension (a humanistic point of view for everyday life) and the aesthetic-technical dimension (a positivistic point of view for physical environments). As a philosophy of practice, it emphasizes the historicality and practicality of thinking and the unity of theory and practice. Moreover, considering the current Chinese situation in general, thinking of spatial phenomenon has its primary thesis of socio-spatial integration, which recalls the Chinese tradition of approaching-to-the-good society and is the ethical task of contemporary Chinese urban rehabilitation. My research study is thus enframed by the methodology of thinking of spatial phenomenon. It is both problem-driven (the problems on housing and urban renewal for the former socialistic public housing areas in Beijing) and purpose-driven (the purpose of socio-spatial integration in the context of the hybridity of ethoses in a transitional society). And the research followed a matrix composed of its historical and dimensional axes. The former axis represents the consideration from a historical review and the analysis of the status quo to the referable case studies and the development of new strategies, while the latter is demonstrated by the analyses in the socio-economic, community-placial and aesthetic-technical dimensions in each section. This research framework is presented in my writing. In this book, Part II, following the introductive Part I, reviewed the historical evolution of Beijing’s socialistic public housing in the socio-economic, community-placial and aesthetic-technical dimensions, respectively. Part III subsequently analyzed the current urban housing problem, the existing conditions of Beijing’s former socialistic public housing areas and the dilemma of urban renewal. It concluded by raising the concrete challenges of an alternative approach for renewing those housing areas. These challenges comprise the balance of housing affordability and economic sustainability, the stabilization of mixed community and the alternative physical initiatives instead of the wholesale reconstruction. In order to answer to these challenges, the study in Part IV focused on several successful and referable experiences of urban renewal in cities with a comparable context, i.e. Amsterdam, Rotterdam, Berlin, Vienna and Hong Kong. And Part V, based on two “pilot design research projects” on Sanlihe Neighborhood 1 in Beijing, developed a proposal for rehabilitating the former socialistic public housing areas in Beijing. This proposal is called an integrated plural approach. This approach is made up of six recommended strategies that are also sorted by three dimensions. 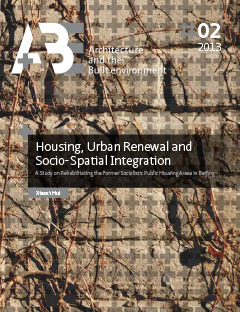 There are housing re-socialization and economic sustainability in the socio-economic dimension, housing differentiation and community participation in the community-placial, as well as a combination of housing renovation and reconstruction and an integral physical planning/design in the aesthetic-technical dimensions. In conclusion, while those strategies gave answers to the existing practical challenges, the integrated plural approach in all proposed a new establishment of urban rehabilitation to adapt to the hybrid, diverse and plural Chinese situation and to fulfill the ethical task of sociospatial integration. However, in comparison with drawing concrete conclusions, this research study has more to do with inspiring reflection. On the one hand, my study on rehabilitating the former socialistic public housing areas in Beijing can only be concluded as a proposal, same as many other urban studies. The applicability of an integrated plural approach must be proved in practice. A proposal of urbanistic research has to be tested and modified within urban practice. On the other hand, this book cannot be seen as an end but as a beginning of new explorations in urban study, theoretically. The openness, inclusion and integration of thinking of spatial phenomenon might contribute to the establishment of new ontology and methodology for the study of not just Chinese but also universal urban issues in an era of globalization.